Blonde Redhead in Montreal or Quebec City? Inform me about the next events for Blonde Redhead. Enroll yourself to our priority waiting list for Blonde Redhead to be alerted when new tickets are available. Filling this form doesn't engage you to any purchase. Blonde Redhead will be performing in Montreal on October 16th, 2010, for a concert at the Metropolis. Formed in New York city in 1993 by a Japanese lady and a pair of Italian brothers raised in Montreal, Blonde Redhead released 7 studio albums in a genre that sounded somewhat like Sonic Youth at the beginning of their career, but progressively moved away from that sound. 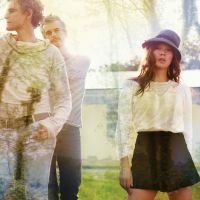 Expect a new Blonde Redhead album, entitled Penny Sparkle, to be launched on September 13th, 2010. The band was part of the Ottawa Bluesfest programming last July, but didn't come to Montreal.